Sunrise and sunset represent a short period of time where there are changes in the intensity of light and the colour of the sky signifying the transition between day and night. It is important to note that sunrise and sunset occur as a result of the earth's rotation and not the movement of the sun around the earth. We obviously know the sun does not revolve around the earth. Nevertheless, it is more "convenient" to associate the sun as the object moving across the sky (which is its relative observed motion) especially when refering to and explaining weather concepts. Both sunrise and sunset reveal changes in the colour and intensity of the sky during the morning and evening respectively. The changes in colour occur due to light passing through the atmosphere being scattered at different frequencies. The frequencies that lie in the spectrum of red will be scattered by light particles more than those frequencies in the blue spectrum. This means that the sky near the sun on the horizon will appear red since the light will be scattered to the observer. On the other hand, red light from the sun whilst it is well above the horizon will be scattered away from the observer. The light from the blue spectrum will be scattered least and hence pass through the atmosphere straight to the observer. The sky therefore during the day will normally appear blue. The light during the period from dawn to sunrise increases in intensity near where the sun will eventually rise and eventually covers the whole sky area. The intensity also increases radially away from the sun's rising position. It therefore becomes easier for an observer to predict where the sun will rise. The process during sunset occurs in reverse. Of course there are other factors that influence how sunrises and sunsets vary from one location to another. The latitude is one of the most important factors and is directly associated with the length of sunrises and sunsets. For instance, in the most extreme case, both the north and south pole during their respective summers have 24 hour sunshine just above the horizon and therefore have the longest sunrises at certain times of the year. During winter, the sun is completely gone with complete darkness. Another factor is the altitude. 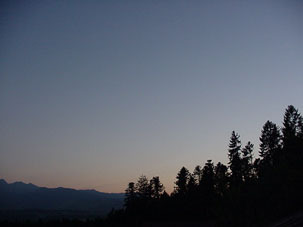 In fact, altitude can influence the appearance of sunrises and sunsets in two ways. 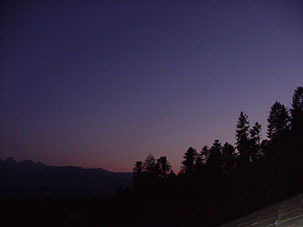 First, if the observer is located in high mountains, the sunrise and sunsets may appear earlier or later depending which way the mountain faces . Second, if other areas exist to disturb the pattern of the normal landscape, then this will influence the amount of colour visible during sunrises and sunsets.